Some things I find interesting. 1) How could a purple person ever resist a purple cover? 2) The scarcest recent US usage? 3) 19¢ Sequoyah... the most difficult Great American usage? Intelpost... what the heck is that all about? The full explanation has been published... click the image for the full story. I love to collect the Liberty series, the stamps and their usages. Click the image below for some interesting usages... especially of my favorite Liberty stamp, the 6¢ Roosevelt. Postal Counterfeits are not created to fool collectors but rather to defraud the postal service. Which is the real stamp and which is the counterfeit? Click the image below to find out which is which and to learn about some other postal counterfeit stamps. Often called by different names such a computer vended postage, postage on demand or web postage, these are real stamps. 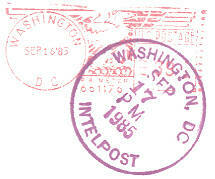 While the look is similar to meter, these are true stamps which can be used at any time from any US location. While the page is still under construction, click the image above for a sneak peak. 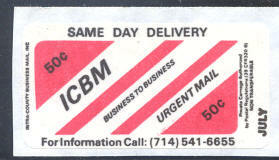 E-COM mail was instituted by the United States Postal Service (USPS) on January 4, 1982. After less than four years of operation, the service was ended on September 3, 1985. Some of the whys and wherefores of this USPS venture into computer technology can be found by clicking the image above. 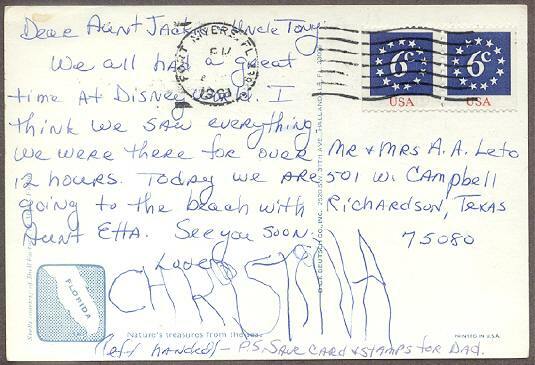 Have you ever seen and wondered about stamps such as these? Were they used by private delivery services, mail consolidators or some other type of service? Since at least 1909, dummy testing stamps have been produced by the US Bureau of Engraving and Printing (BEP). Some of the stamps were produced to test BEP's own printing and manufacturing processes. Others were produced for use in setting up postal vending machines, stamp affixing machines and for demonstration purposes. Private companies also produced dummy stamps to work with their equipment and to demonstrate their products. Click the image below for some examples of these fun to collect dummy stamps. .
You will also find new information on recently discovered faked dummy stamps. For years the Disabled American Veterans (DAV) has added low value stamps to the return envelopes included with the solicitation mailings. These covers not only provide a chronicle of modern US coil stamps but also document USPS mailing requirements especially for the recent 32¢ rate period. If imitation is the sincerest form of flattery, then DAV leads the nation in applause from other non-profit mailers which have followed DAV's example by adding postage to return envelopes. For several years the USPS has been testing a program to track Priority Mail. While the program was introduced nationally on March 14, 1999, look here for examples of labels/usages of the program when it was in its testing period. This page is subject to change at a moment's notice. Please feel free to drop in anytime you are in the neighborhood. E-mail comments are always welcomed. We collectors love to show and tell. For a link to see what's of interest to other collectors click <here>. That page is maintained by Matthew Liebson who would appreciate links to other collectors' philatelic show and tell pages. I'm proud of my membership in these philatelic groups. Want to know more about them and how membership can help your collecting interests? Click on the logo to go to the site.